The nature of residency is looking up the same information again and again until it sticks in your head. Reading ECGs takes practice and one needs to develop a systematic way to read them. As a senior resident now, I find it really fun teaching interns ECGs! So I compiled many of the resources I’ve read about ECGs into a simple one-page rapid interpretation pdf! 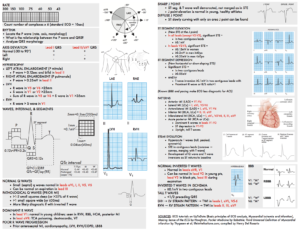 Download the one-page rapid interpretation ECG cheat sheet v5.2 here (last update 5/2018). In particular, I found many people confused about the criteria for diagnosing ischemia and infarction, Q waves, and T wave inversions. So I defined those and gave examples. Of note, many resources claim different definitions/criteria to diagnose certain parts of the ECG (ie. LVH). I chose what appeared to be the most common and the easiest for myself to remember. 9/23/2015: Added the definitions for STEMI and NSTEMI. 7/18/2016: Rearranged sections. Added R wave. Added RBB. Added sources. 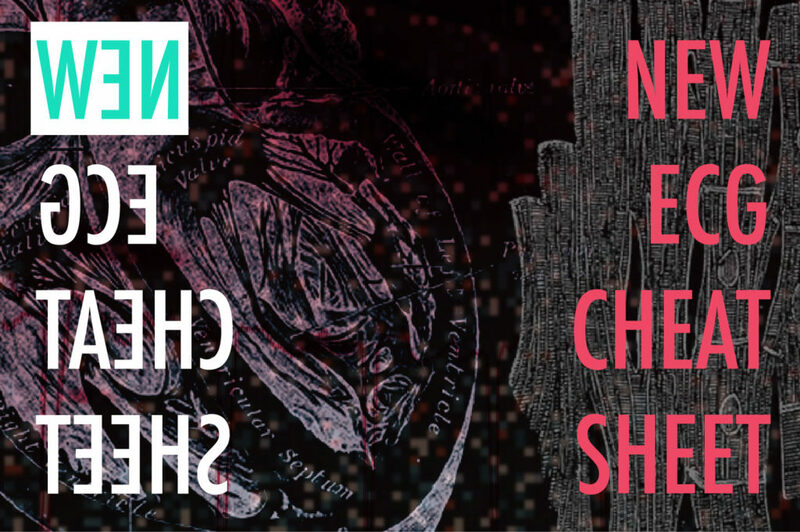 2 Responses to "New ECG Cheat Sheet"
Hello– your ECG resources are great. I am a faculty at Touro University CA and your review sheet showed up from one of the students. I like it very much but have some minor edits. I am wondering if I can make those edits ( remove >2 small squares deep in path Q waves, add lead V1 for LAE assessment, remove gender differences in ST elevation and remove inverted T waves in young patients and black patients and absent in respiration.I would also use a different graphic for LAE and RAE. How much does a Family Physician work?